As we swim, climb and burrow through some of the most interesting astrology in many years, I am in the process of doing my 12-sign Spring Reading. This is an intimate look at the grand cross of April 2014 and how it will influence each of us. I will tell you more about that in a moment, but business before pleasure. I was traveling last weekend and neglected to prepare this letter to you before leaving, prior to the price increase. Upshot is that we were offering the Spring Reading at half price before the price went up Monday, March 31. Therefore here is the initial rollout half-price offer of $29.95 for all 12 signs, which will be valid through Sunday midnight EDT. Note, this is a pre-order purchase; our best price is always pre-order. The product will be ready in about one week. As for what this group of readings is: a guide to some of the hottest (as in temperature and temperament) and most provocative astrology of our lifetimes. All 12 signs and rising signs are covered. Here is a short, fun audio preview of the project. Whether you look at this season's astrology as loaded with potential or with peril, it's most certainly the occasion for focusing on and understanding the messages of the planets -- and that is what I have for you. Because the key planet involved is Mars, I am focusing on desire, relationships, intimacy and trust. Because I like my clients to have money, I always include tips and core concepts about business and finance. The two topics are directly related, since Mars is the money planet as well as the planet of drive and desire. Mars is in Libra, home of Venus -- an important sign about getting our priorities in order. 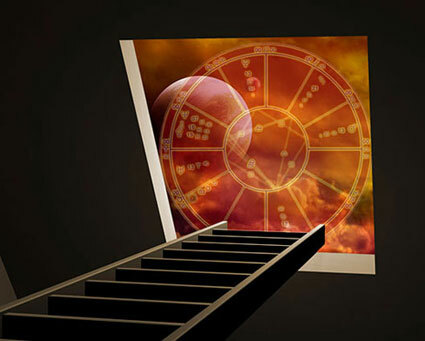 Since the dawn of modern astrology in the 1930s, astrologers have been trying to figure out a way to get a good product to a larger clientele without the need to do one-on-one readings. Most of the prepared "natal readings" and "transit readings" you see are database generated. The parts may be interesting but there is no whole; there is no overarching view or theme. 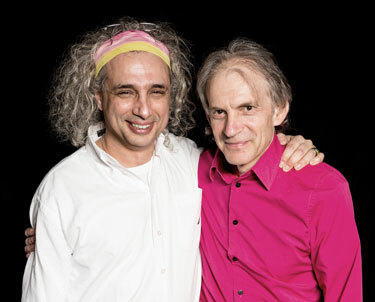 Eric with his astrology teacher and musical collaborator David Arner, March 8, 2014. Photo by Jeff Bisti. Sometimes the parts conflict, and nobody is there to resolve them. It's a little like having the ingredients for breakfast, lunch and dinner and nobody to run the kitchen. With my readings, I serve a full, home-cooked meal. There are no canned ingredients; everything is fresh, locally sourced and in season. I am using basic elements of astrology, blended with my intuition and knowledge of people and the world. I am also aware that I access some core astrological source; that I tap directly into something when I do this work. These readings work better than they're supposed to. The feedback I get from my clients, in all sincerity, blows my mind. I knew I could do a good job on these readings when I got started, but I had no idea how well they would work, that people would listen three or four or more times taking notes, that they would use them as healing tools in their relationships. One client wrote to me today, "I'm highly grateful for the work you do. All of the readings I have gotten from you have touched my soul the core of its very essence. I just ordered a Gemini reading for my other half, a/k/a soul mate. We both listened to the reading together this morning and it had such a profound effect in more ways than one; with this knowledge we become closer in knowing that we have the power to create a life of abundance and purpose." Yes, that is my intention when I do this work; it's a privilege to have this talent and an honor to share it with you. Here is your discount link again, valid all weekend. Thank you for your interest and for doing your metaphysical shopping at Planet Waves. PS: We always offer the most attractive price to those who pre-order. On Sunday night, this offer will go up to $39.95 and then the final price after publication will be $59.95. For your peace of mind, all purchases are guaranteed.